John Linnell (1792–1882), Evening, Bayswater (1818), oil on panel, 38.3 x 58.1 cm, Yale Center for British Art, New Haven, CT. Wikimedia Commons. John Linnell (1792–1882) is perhaps best known now as a patron and supporter of William Blake in his later years. In his day, he was a successful and prosperous painter, of the generation after JMW Turner, John Constable, and James Ward. He made a good living from portraiture, but his most significant genre was the landscape. He was born in London, into an artistic family, and was a precocious artist himself. His early training took him to the best teachers of the day, including Benjamin West and John Varley, before he was admitted to the Royal Academy Schools in 1805, at the age of just thirteen. There he was taught by Fuseli, who recognised his talent. He also trained as an engraver, and throughout his career was involved in engraving projects. Samuel Palmer married his daughter Hannah; as a father-in-law and older artist, Linnell seems to have earned himself a fierce reputation. Linnell’s first exhibited works were two small landscapes, which were shown at the Royal Academy in 1807, and the following year he sold his first landscape for twenty guineas. 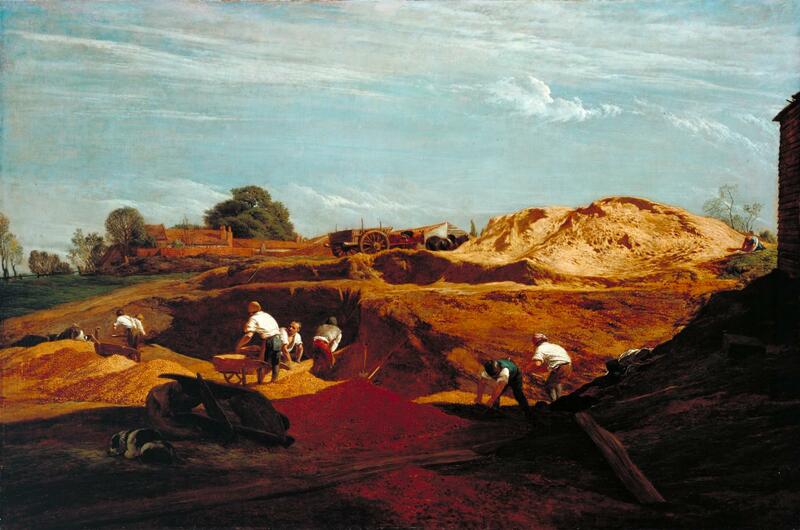 Kensington Gravel Pits (1811–12) gives a good idea of the quality of Linnell’s early paintings, and is an important historical record. 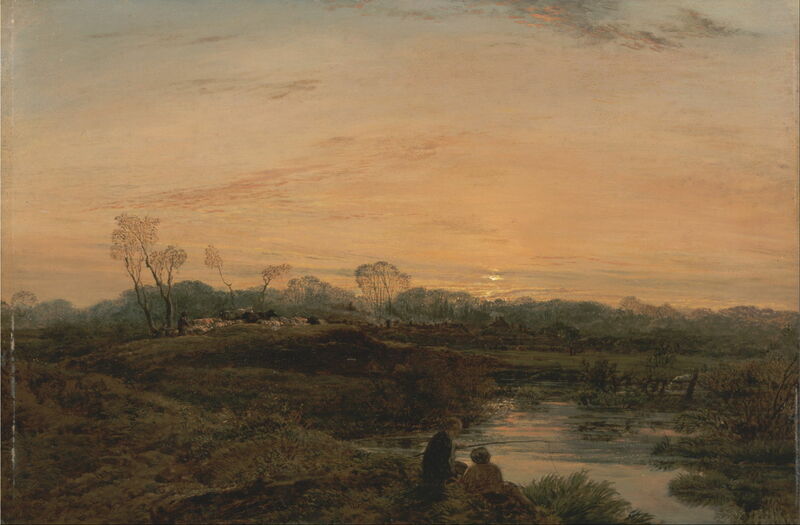 When he painted this, Linnell was living in what is now known as Notting Hill Gate, in London – but was then the village of Kensington Gravel Pits. These open quarries had supplied gravel for the construction of London since the early sixteenth century. 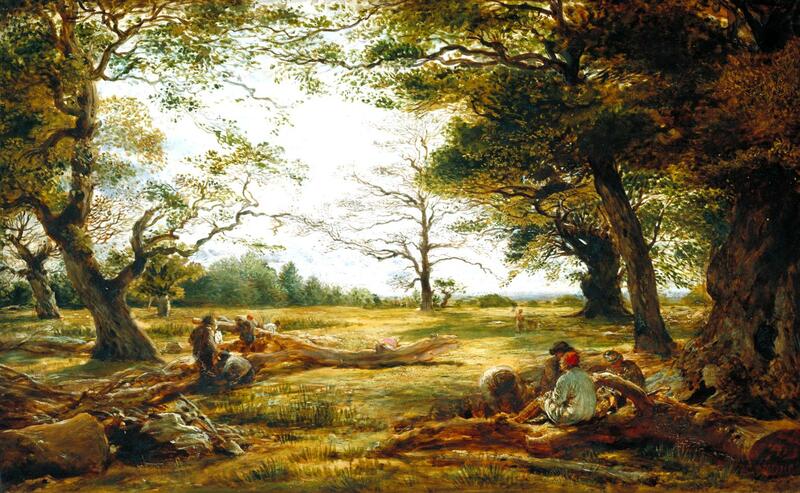 The Kensington area was then quite rural, which was an attraction to Linnell and his colleague and friend, William Mulready (1786-1863), with whom he shared accommodation at this time. Exhibited at the British Institution in 1813, it enjoyed some favourable comments, but did not sell until later that year. In the summer of 1812, Linnell embarked on his first painting tour of north Wales, where he saw his first mountain, and made more than a hundred watercolours and chalk drawings. The following winter, he made finished paintings from some of those. However, he was beginning to realise that landscape painting was unlikely to bring him a secure income, sufficient to raise a family. In 1813, he started to paint portraits, which quickly took up much of his time. John Linnell (1792–1882), A Landscape in Snowdonia with a Tree in the Foreground (1813), pencil and watercolor on paper, 23.7 x 37.4 cm, J. Paul Getty Museum, Los Angeles, CA. Wikimedia Commons. 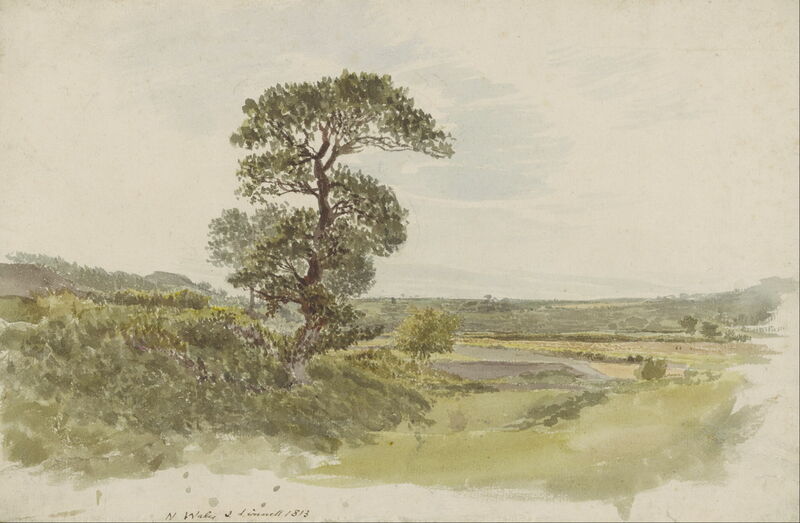 A Landscape in Snowdonia with a Tree in the Foreground (1813) is an example of his fine watercolour paintings made during his summer painting tours at this time. 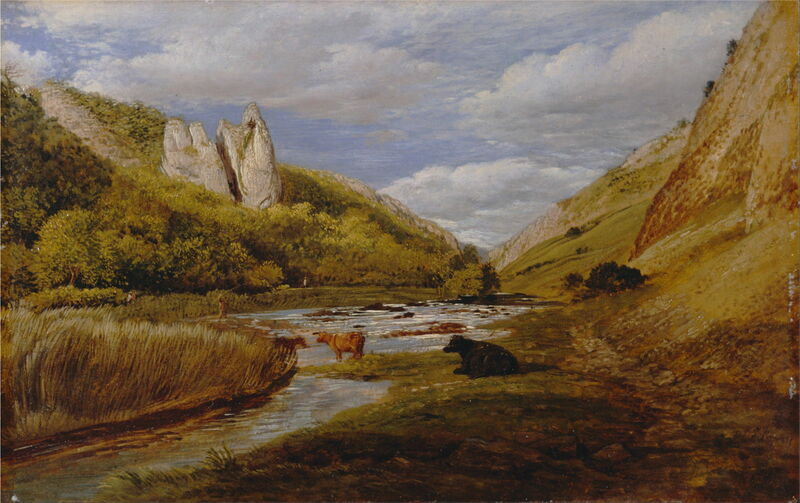 John Linnell (1792–1882), In Dovedale (1814-15), oil on paper laid on board, 22.9 x 17.1 , Yale Center for British Art, New Haven, CT. Wikimedia Commons. He also seems to have visited the Peak District of England, where he made preparatory sketches for this detailed view In Dovedale (1814-15). John Linnell (1792–1882), Landscape with Figures (1816), oil on panel, 22.9 x 17.1 cm, Yale Center for British Art, New Haven, CT. Wikimedia Commons. Landscape with Figures (1816) appears to have been based on sketches made during May 1815 in Windsor Forest. Linnell, his fiancée Mary Palmer, and a chaperone stayed for a month in the village of Winkfield, allowing him excursions into the ancient woodland nearby. Later in the summer he toured the Isle of Wight, where he also painted landscapes. Linnell was deeply religious, but fiercely non-conformist in his beliefs. He had learned Hebrew and Greek so that he could read the Bible in ‘original’ versions, as he did not trust translations into English. Unhappy with conventional church wedding ceremonies, he took his bride to Scotland so that they could be married under a civil ceremony in 1817. The couple stayed on for Linnell to paint some portraits there, and to sketch some mountain views. At the end of 1817, Linnell started his first religious painting, and the following year he met William Blake for the first time. Evening, Bayswater (1818) appears to be another view of the then rural parts of London, out to the west of what is now Paddington Station. It also shows Linnell’s delicate handling of the light of gathering dusk, something that was to develop further later in his career. During the 1820s, Linnell’s portraiture flourished, thanks to some fortunate introductions to suitably affluent customers. He also got to know Blake very well, and found ways of bringing relief to Blake’s dire poverty, by bringing him commissions and joint ventures. Linnell first commissioned Blake to paint a second set of the paintings of the Book of Job which he had previously produced in 1805, then in 1823, Linnell and Blake signed an agreement under which Blake would engrave them for a fee of £100, plus a further £100 from any profits resulting from their printing and sale. Linnell also fostered the development of younger artists. He met his future son-in-law Samuel Palmer (who was no relative of Linnell’s wife, despite having the same surname) in 1822, and introduced him to William Blake in 1824. 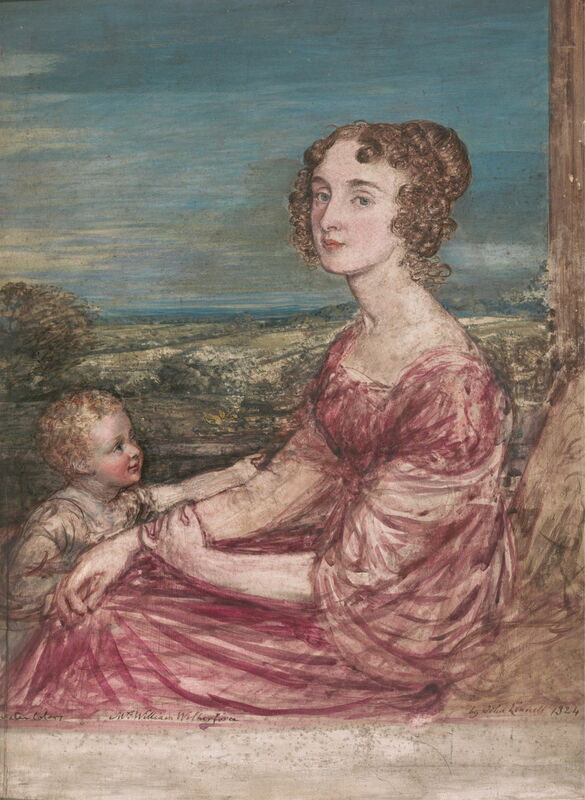 John Linnell (1792–1882), Mrs. William Wilberforce and Child (Barbara Ann Wilberforce) (1824), watercolour and gouache over graphite on scored gesso ground on panel, 35.6 x 26 cm, Yale Center for British Art, New Haven, CT. Wikimedia Commons. Linnell’s portraits were also available in unconventional media. He had for several years been painting miniatures on ivory, and this informal portrait of Mrs. William Wilberforce and Child (1824) was painted in watercolour on a gesso ground. Barbara Ann Wilberforce (1777-1847) was the wife of the abolitionist MP William Wilberforce, who led the parliamentary campaign against slavery. Blake’s Book of Job was finally published in 1826. It had cost Linnell a grand total of £266, much of which had gone straight to William Blake, but Linnell never recouped that cost. Blake’s health was deteriorating at the time, and Linnell persuaded the Blakes to stay with his family for a while to recuperate. When Blake died in 1827, it was Linnell who paid his funeral expenses, and supported Blake’s widow. John Linnell (1792–1882), Shepherd Boy Playing a Flute (1831), oil on panel, 22.9 x 16.5 cm, Yale Center for British Art, New Haven, CT. Wikimedia Commons. 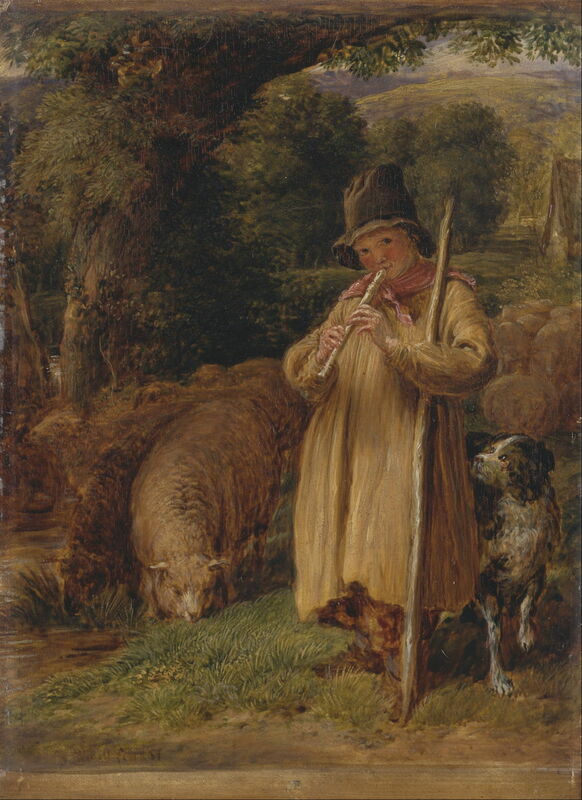 Linnell also painted a few rustic genre scenes, such as his Shepherd Boy Playing a Flute (1831). 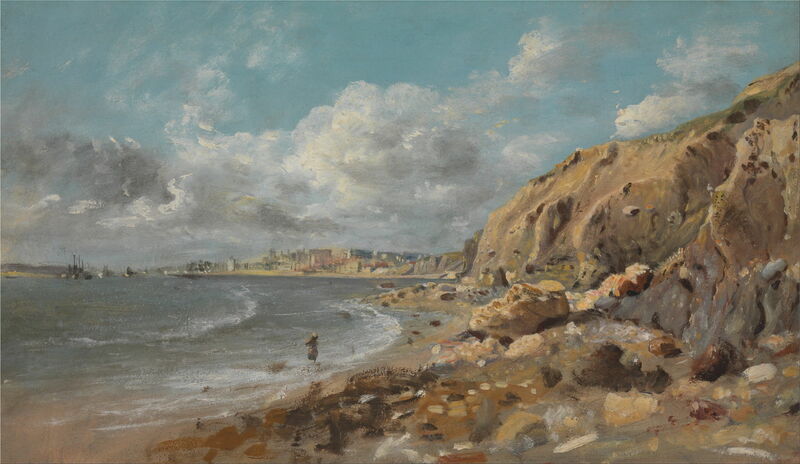 John Linnell (1792–1882), Coast Scene at Cullercoats near Whitley Bay (c 1834), oil on paper on masonite board, 21.6 x 36.8 cm, Yale Center for British Art, New Haven, CT. Wikimedia Commons. On one of his trips to the north-east of England, Linnell seems to have stopped at the fishing village of Cullercoats, where he painted Coast Scene at Cullercoats near Whitley Bay (c 1834). This was the village that Winslow Homer lived in during 1881-82. 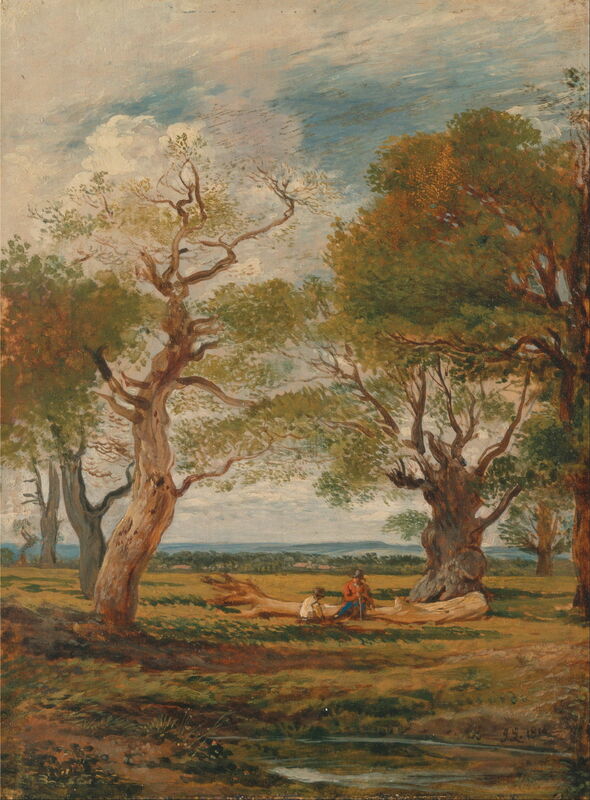 Linnell continued to paint finished works, such as his Windsor Forest (Wood-Cutting in Windsor Forest) (1834-35), from his earlier sketches. In this case, he used work which he had originally completed nearly twenty years previously, when he had stayed in Winkfield with his then fiancée. In 1837, Samuel Palmer eventually – after several years of engagement – married Linnell’s daughter Hannah. His former pupil was now part of the family. Posted in General, Painting and tagged Blake, landscape, Linnell, Mulready, painting, Palmer. Bookmark the permalink. Didn’t know about the time in Winkfield – where exactly did he stay? I’m afraid that David Linnell’s book gives no further details, nor any reference. Apparently they stayed for most of May. I hope that Winkfield still has a pub with good records?! Yes it still does – has several actually, one of them – the White Hart right in the oldest part of the village – rather on the old side. Never worked in it, don’t really know what it is like. It is, and probably the only real collection of images of his paintings. That’s a real bargain: it’s a large and quite thick book. That is almost a giveaway price for it.